A Backpack Lifestyle: Net Impact...for whom? The Cohort 5 and 6 executive members of Colorado State's Net Impact chapter headed to Baltimore this year to represent our newly achieved "silver status". Woot! We kicked off Thursday night with some stellar keynotes. Freeman Hrabowski (<--Click for AMAZING Time bio), the president of the University of Maryland (Baltimore County) received a standing ovation for his recount of time spent in jail at the age of 12, earned during a march for civil rights in 1960's Alabama; followed by a rousing articulation of the gaps in the US education system. Yes, we are broken. Yes, we have certainly lost our edge on the hard sciences...but he finished on a high note borrowed from Aristotle: "Choice, not chance, determines your destiny." And the conference was off. That night we were all eager to get out and enjoy the bounty of the east coast. The food in this town is incredible and my fellow Cohort 5 ladies and I blew through our food budgets with no guilt whatsoever. I've been on the strict grad-school regimen of rice, beans, coffee, and beer. Bring on the homemade charcuterie and crab cakes! 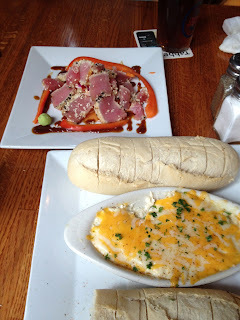 Crab dip and Ahi tuna...not totally proud of the tuna choice. Something that drove me crazy at last year's event as well as this time around was the OVERabundance of disposables used. Yes, there were 2,700 participants. Yes, we are all caffeine crazed type-As. 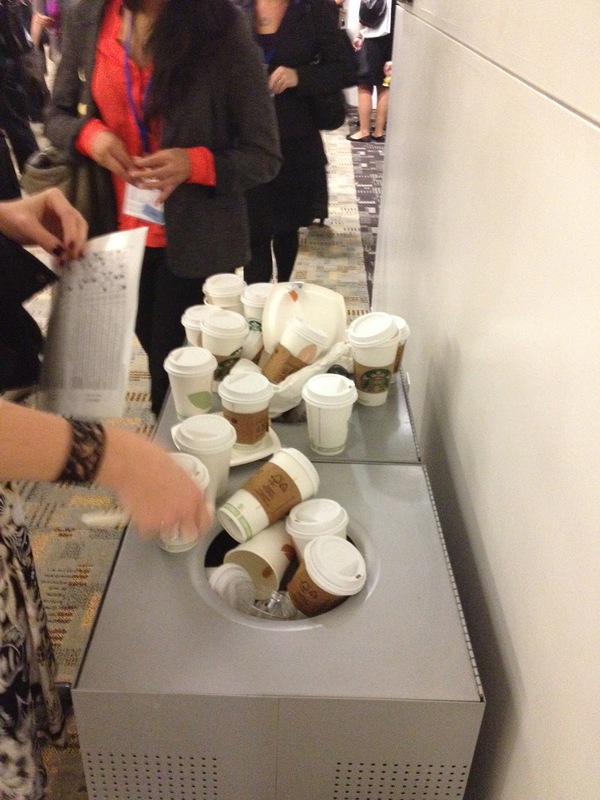 Yes, I understand the environmental impact of producing a zillion reusable coffee mugs is probably greater than the waste generated by the thousands of paper cups pictured here. Most worrisome were the hoards of sustainability professionals dumping their cups into the landfill box with a pitiful shake of the head and a "FOR SHAME" look of distain...as they added to the piles. People. This is NOT what Aristotle was talking about. Choose a better destiny and BYO Cup. I realize this is an ironic rant to directly follow my indulgent food pictures. It's my blog. I was struck by how different I felt leaving this conference in comparison to last year. In fall of 2011, I was just cutting my MBA teeth. Eager to absorb and near desperate to get a handle on this animal called sustainability, I took every panel in with a breath of hope and heard a positive message. Cut to fall 2012. A year into my program and 8-weeks away from graduation, I was initially startled at the critical attitude I was applying to each speaker. Why didn't the One Laptop per Child founder address his impact measurements at all? Why doesn't the speaker from Merck Pharmaceuticals know more about the company's water usage? What is Coke doing speaking about product liter for water liter usage and restoration efforts in such vague terms that it seems to be happening in a galaxy far, far away? And why, OH WHY is Monsanto at the career/exhibition fair????? The fact of the matter is that sustainability has. no. definition. Theoretically, it means to operate in a manner that leaves enough resources for future generations. I believe it is also a subjective term that aligns with one's personal values; animal rights versus hormone usage versus labor exploitation versus natural resources versus profit maximization versus job creation versus what feels good in your heart and mind...your sustainable reality is based on what matters to you. What does that mean when we're facing a rapidly escalating population that will hit 10 billion (in my lifetime)? I realize it was necessary to pull the big hitters in, such as Johnson & Johnson, PepsiCo, and General Mills. These are industry giants that have the dollar power to shift markets with sourcing and marketing decisions. However, when we are given the corporate line over and over on Proposition 37, lack of consumer confidence, and ambiguous language on global water governance, engaging with giants becomes tiresome. I appreciate the mostly sincere effort to engage in these conversations by the corporate players. Business-based global alliances are just as powerful as the political ones and certainly play with more flexible dollars. Coming away from the conference this year, I realized that I have no idea where I belong in this world. While I will always lust after a cabin in the woods near a babbling brook...is it finally time to put the big girl suit on? Is it worth it to jump in and attempt to make incremental shifts in the companies where change is slow to come but large when it arrives? Do I shoot for the smaller, more agile organizations, whose goals I more likely align with. I no longer feel that corporate = greed or that start-up = poor or that nonprofit = altruistic. The rules are constantly bending, changing, and being rewritten. All I'm sure of is that I want to be one of the co-writers. Rachael, thanks for sharing your thoughts. It was the first Net Impact conference I'd attended, and my impressions mirror many of yours. I was quite surprised to see so few people toting reusable bottles - have they fallen out of favor with college students? You may want to check out Green America's Greenfest conferences and the Green Business Network. You'll find a very strong and inspiring focus on environmental sustainability.